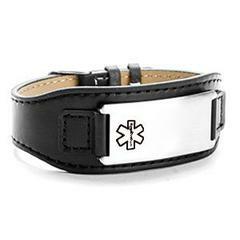 Our awesome adjustable black leather and stainless steel medial id alert bracelet is great for men, woman, kids and teens! Adjustable from 5 1/4" to 7 1/4". This will be engraved free of charge in black laser engraving! This is such a unique and stylish eather medical id alert.